The BF2C-1 was initially designated as XF11C-3 which was a development of the F11C-2 that introduced retractable landing gear to the Curtiss fighters. In flight test, the XF11C-3 was faster but the additional weight of the retractable landing gear had a negative affect on maneuverability. In addition, Curtiss replaced the wooden wing structures in the lower wing with metal and the resulting design was ordered as the BF2C-1. Like many fighter designs that become obsolete as fighters, the BF2C was designated as a Bomber-Fighter (fighter-bomber in modern terminology). Twenty-seven examples were ordered by the Navy and assigned to VB-5. These aircraft only remained in service for a few months due to problems with the landing gear. Many years ago, Hasegawa produced four kits in 1/32 which remain timeless - they are as good today as they were when first released. 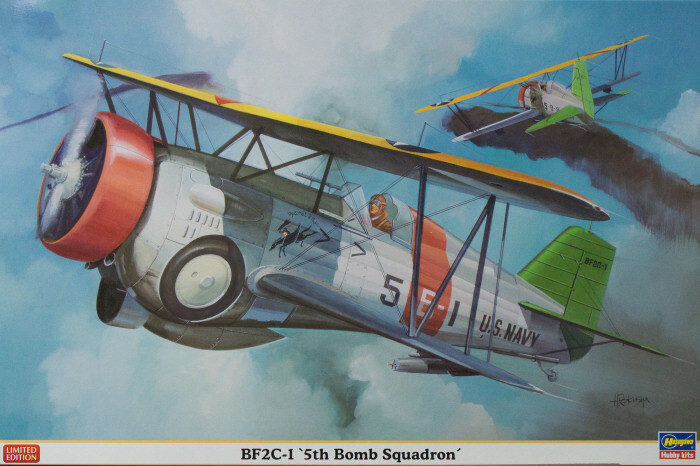 These kits included the P-26 Peashooter, F4B-4, P-12E, and BF2C-1. These kits were easy to build yet were relatively detailed. Like many Hasegawa kits even today, the cockpits tend to be simple, but otherwise all of the raised details of the day are still relevant because those details were raised on the original subjects. 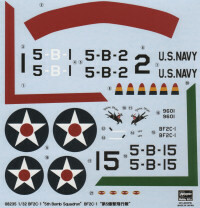 The decal sheet provides options for three aircraft but Bureau Numbers for only the first example. Extra tri-color propeller-tip decals are included should you have difficulties there. Kits out of this series have been reissued a few times over the decades though this one hasn't been around in some time. It is nice to see it back on the shelf even for a short time (this release is in their limited edition series).